Dysect Pour On for cattle is a topical application to control flies and lice. A clear, oil-based, ready to use topical ectoparasiticide containing 1.5% w/v alphacypermethrin. Dysect Pour On for sheep is for the control and treatment of blowfly strike on sheep and lambs and for the treatment of lice and ticks on sheep. Provides protection against blowfly in sheep and lambs for up to ten weeks. Reduces the incidence of headfly strike in sheep and lambs for up to six weeks. Provides control of ticks in sheep for up to twelve weeks. A dark green, oil-based, ready to use topical ectoparasiticide containing 12.5 g/l alphacypermethrin. A ready to use topical insecticidal solution containing 15 g/l alphacypermethrin. For topical application to control flies and lice on cattle. All cattle, 10 ml per animal. Apply a single 10 ml dose, with the applicator gun, from the crown of the head down the neck and along the middle of the back of the animal. To control biting and nuisance flies, treatments should be repeated as necessary. Frequency of application will depend on the numbers and species of flies present; normally nuisance flies on the head and face can be controlled for up to four to five weeks and for the biting horn fly for up to eight weeks. To control sucking and biting lice, one application treatment will normally eradicate all the lice. If a few lice survive on individual animals, it may be necessary on very rare occasions to re-treat an animal. Dysect is of low toxicity and acute poisoning is unlikely to occur. Signs of discomfort may be exhibited by some animals after treatment. This will not last longer than 48 hours and will have no lasting effect on the animal. Wear waterproof apron and boots and impervious gloves when applying the product and when handling recently treated animals. Do not store above 25°C. Store in tightly closed original container. Store away from food, drink and animal feedstuffs. Dangerous to fish and aquatic life. Do not contaminate ponds, waterways or ditches with the product or used containers. 250 ml, 500 ml and 1 L HDPE dispenser pack. Not all pack sizes may be marketed. A ready to use topical insecticidal solution containing 12.5 g/l alphacypermethrin. The product is applied using an adjustable dosing gun fitted with a T-bar, at a rate of 40 ml for animals weighing 25 kg or more, and 25 ml for animals weighing less than 25 kg. For dosages of 40 and 25 ml apply as two half-doses. Apply the first half-dose evenly along the back line from the neck to the saddle and the second half-dose evenly from the saddle to the tail head and around the rump. For the control of blowfly it is important that there is good coverage around the tail area. The T-bar must be held against the fleece so that the dose is applied directly into it. For treatment of existing strike apply the dose directly to the struck area. Most strikes will require the application of 5 ml (saucer size) or 10 ml (dinner plate size). For the reduction of headfly strike 5 ml per animal is applied between the horns, irrespective of size of the animal. Blowfly – For the control of blowfly a single application will normally provide 8 to 10 weeks protection. Re-treatment may be necessary after this period. For the treatment of blowfly strike, a single treatment applied to the infected area will ensure blowfly larvae are killed. Ticks – A single treatment will normally provide control of ticks for 8 to 12 weeks. Headfly – A single treatment will reduce the incidence for up to 6 weeks. Lice – A single treatment will normally kill all lice. Because alphacypermethrin is retained in the wool grease of the fleece, it is recommended that the product be applied to sheep with a minimum wool length of 1.0 cm. Do not treat lambs under one week old. Avoid treating animals in very hot weather. Discolouration of the fleece may be observed in some sheep from approximately 6 to 8 weeks after treatment. Use the product in a well-ventilated area. Wash any splashes from the skin and eyes immediately, using plenty of water. Remove heavily contaminated clothing immediately and wash before re-use. Wash hands and exposed skin with soap and water after treatment and before eating, drinking and smoking. Milk: not for use in sheep producing milk for human consumption. Store in a dry place. Store upright in the tightly closed original container away from food, drink and animal feeding stuffs. Protect from direct sunlight. Do not freeze. If contents freeze they must be thawed and thoroughly mixed before use. Dangerous to fish and aquatic life. Do not contaminate ponds, waterways or ditches with the product or empty container. The container is a fluorinated HDPE backpack dispenser containing 2.5 litre and 5 litre content. Not all pack sizes may be marketed. Alphacypermethrin is a synthetic pyrethroid, which works as an insecticide and repellent by inhibiting neural transmission in insects. Alphacypermethrin is lipophilic and is retained in the wool grease of the sheep fleece to provide protection from blowflies for up to 8 to 10 weeks. Alphacypermethrin has low toxicity to mammals. There have been no tests of the effects of alphacypermethrin on foetal or lamb development. The Simcro Tech 25 ml pour-on applicator gun and associated T-bar is recommended as the product may have a detrimental effect on certain parts of conventional dosing guns and this will also ensure correct application and distribution of the product. 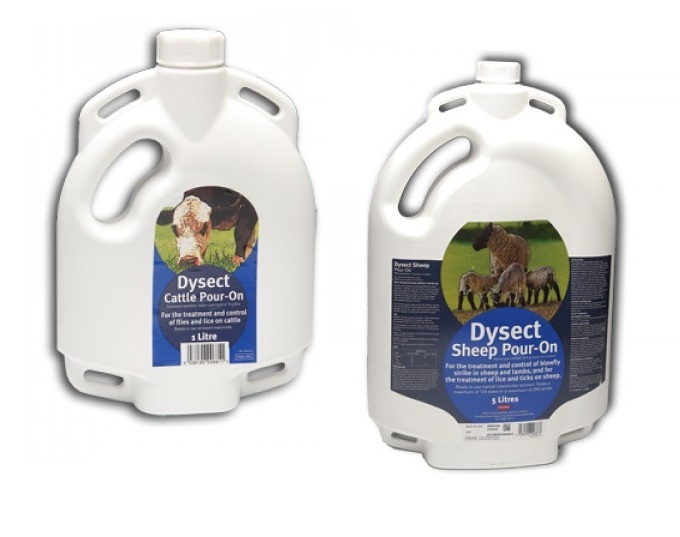 There are currently no questions for Dysect Pour On for Sheep & Cattle - be the first to ask one!